Housed in the former Orangery built in the late Seventeenth century during the reign of William and Mary to house Queen Mary II’s many exotic plants, these gorgeous works of art seem ideally situated now. 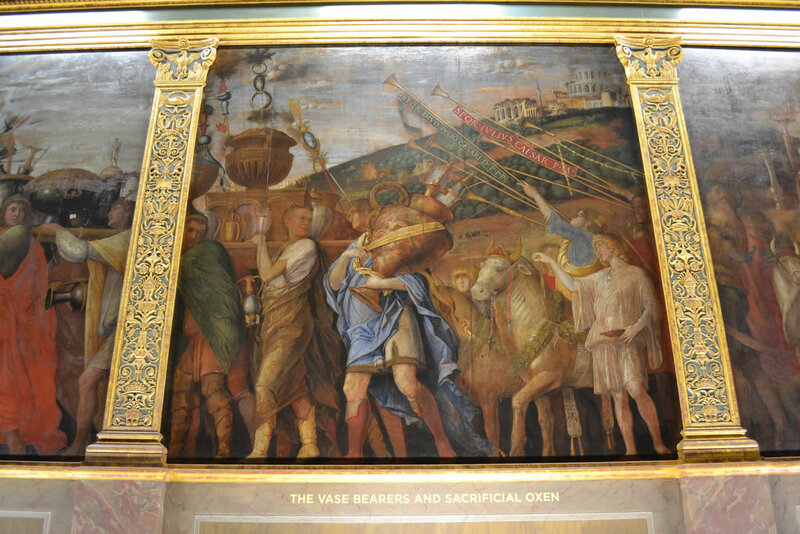 These paintings were bought by their grandfather King Charles I in 1629 and brought over from Italy to England in 1630. They have been at Hampton Court Palace since that time, though it must be said, that they are still here is a little miracle because Oliver Cromwell had a moment of sense in his life and did not have them destroyed during the Interregnum. 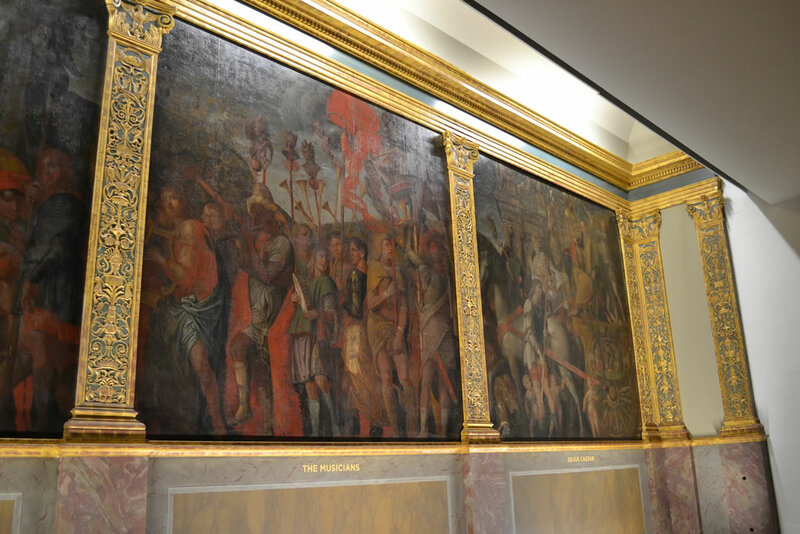 We learned that, sadly, much of Mantegna’s original was painted over by artists in the centuries that followed. They apparently tried to restore the painting, but in doing so, they covered it in new paint and loads of wax, and you can kind of see the waxiness in the photos above and below. As a result of so much “help” from subsequent artists, little of Mantegna’s original work survives under the thick, bright paint. 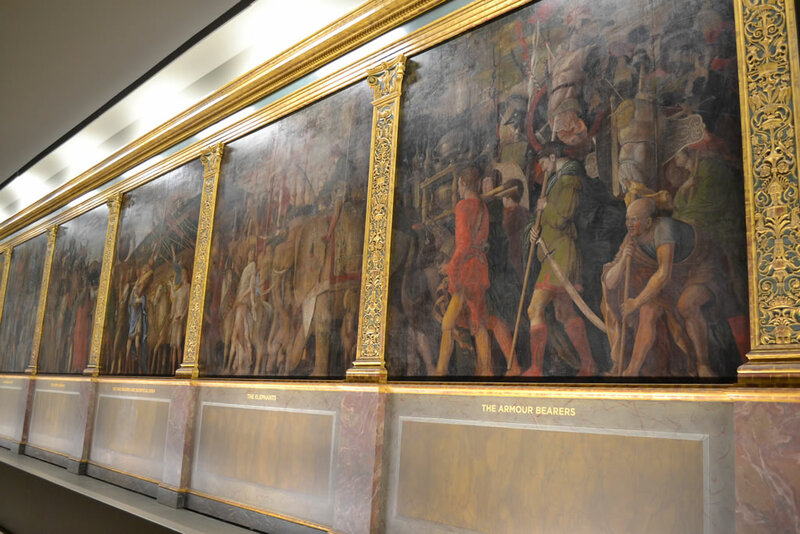 Ask a member of staff to point out the section which is considered the last bit of true Mantegna work left on the artwork. Mantegna’s then-radical use of perspective is quiet amazing. Usually when one looks upon a painting from the 1400s, the perspective is not there, rendering the image 2 dimensional and lacking any semblance to reality. Not so with these – which were done with such skill, such powerful imagery, that it is hard not to have one’s breath taken away by its beauty. Tragically, most visitors overlook this exhibit, and leave Hampton Court Palace without looking upon one of its greatest treasures. Do not do this! Look at it first! 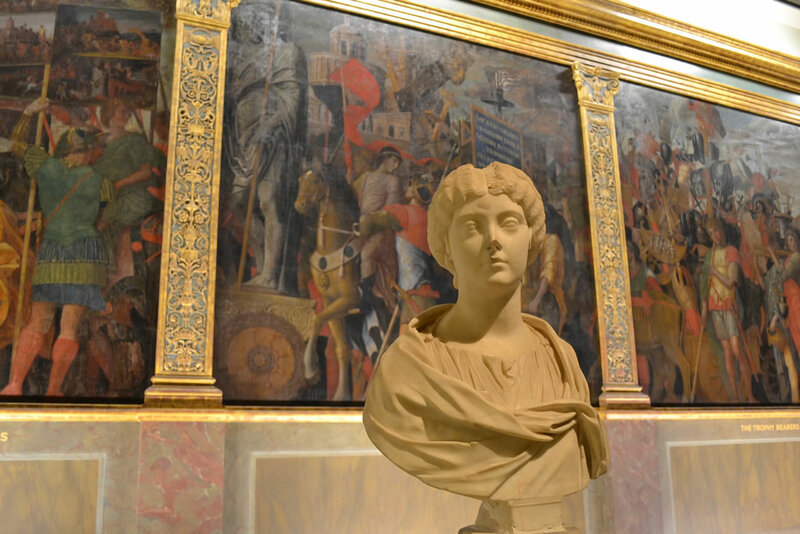 As soon as you get through the main gate, take the first right and follow the signs to “Triumphs of Caesar.” You won’t regret it! Thanks for the tip! I’ll be sure not to miss it when I go to Hampton Court. It will either be next month or sometime later in the year. I’ve never been before and I’m really looking forward to it. What a coincidence. Leaving from Brussels to London today and scheduled for tomorrow is a visit to Hampton Court. Will not miss this wonderful piece of art. I am also very interested in history and love historical novels. Yours sounds very interesting from reviews I have read so they will be next for purchasing. Hello Lisbeth! Thank you for commenting. Did you get to go to Hampton Court? What did you think? Thank you also for wanting to purchase my novella. I hope you like it. I did. We spent all of Saturday 28 September in Hampton Court. We were not disappointed. Took us 4,5 hours just to go through the apartments (except the apartment of young Henry which was closed for works). It was all very interesting and the ‘Triumphs of Ceasar’ was beautiful. A wonderful painting. All the different apartments, kitchen, exhibitions, paintings etc and the time of Henry VIII and William of Orange and Mary made it a history lesson over the centuries. Then the beautiful garden. A visit to Hampton Court is a day spent in good company!